Ok, so I am obviously a little behind in my blogging. I feel like Christmas got forgotten about with the birth of Reddin! We did have a wonderful Christmas, and I wanted to make sure I posted about it, so that it would be remembered. On Christmas Eve we went to our friends' house, the Bergers, for their annual party. I have been going to their house on Christmas Eve since I was a little girl, and it has always been one my favorite nights of the year! There is lots of great food, (Matt's fave is the homemade clam chowder), the nativity put on by the kids and fabulous company to mingle with. 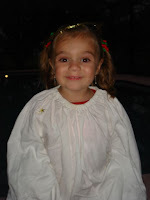 Mattie decided she wanted to be an angel again this year. She was so tired and fighting a cold, so she didn't have a ton of energy like she normally does. She actually fell asleep in Matt's arms and missed the rest of the party. Anyway, back to the nativity. 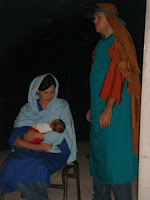 My sister Stephanie and her husband Greg, were Mary and Joseph, since they had newborn Lochlan. Lochlan got to play baby Jesus! It was totally cute. The rest of the evening there was a blast. 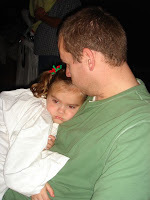 At home we woke Mattie up to do our family tradition of opening up Christmas Eve pajamas. Momo loved her "If the tiara fits" pjs! We also opened up other presents while Aunt Stephy and Uncle Gregy were here that night. Before bed Matt took Mattie outside to sprinkle reindeer food on the lawn. Off to bed little Mo went to dream of what Santa would be bringing her. We have another tradition in our family, that actually came from my grandmother. She grew in England, and on Christmas Eve they put pillow cases at the foot of their beds for Father Christmas to fill with goodies. We have decided to carry on this British tradition with Mattie! In the morning at 8 am, she came into our room to show us what Santa had left for her in the pillow case. British candy of course and a couple of other small gifts. 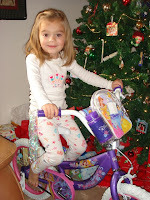 Then we took her out to see the tree and the brand new Disney Princess bike Santa had left for her. (That is what she told everyone Santa was bringing her this year!) 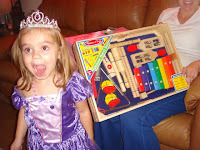 Some of her other favorites that Santa brought her were a kitchen, dress-up princess clothes, make-up and musical instruments! I think that "Santa" went a little overboard this year. I think he felt a little sorry that Mattie's whole world was going to be shook up the very next day, with the birth of her baby brother! It was a wonderful morning. For lunch we went back over to the Berger's house. Andrea Jarvis got some karaoke games for the PlayStation for Christmas, and we had a fun time playing that. I'm actually quite bummed that I didn't record Matt singing Zombie by the Cranberries. It was hilarious, and let me tell you he rocked it out! After having some fun it was back home to pack my bag for the hospital! That will be my next post... the whole story of the exciting weekend Reddin joined our family. 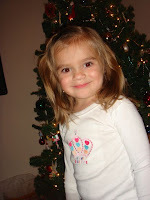 Christmas 2008 was fun for our family! We hope that your holiday season was just as wonderful as ours! Wow! That last picture is fantastic! Mattie looks THRILLED. :) Looks like Santa did well this year. I hope you guys are doing well. I can't wait to see more pictures of Reddin! Momo thanks for thinking of Santa's reindeer, I'm sure they loved your treat. We made sure they were good and healthy when we sent them up to the North Pole. Some of them have come back to Mount Pleasant and we've been putting out food for them to help them through the winter and ready for next year's flight. I love your purple bike! Not only can Matthew sing, you should see him hula hoop! Looks like your Christmas was a ton of fun!!! Matt and I will have to have a Zombie sing off, I too enjoy singing to that song on the Karoke! I love Mattie's bike, to cute! So does she get a pillow case and a stalking? !! You should do 3 wisemen too--on January 6th. I keep forgetting (dangit!!!) to do this with my kids consistently. It's a hispanic tradition I think. My mom used to do it with us. Fun stuff! Happy bday giant fat matt--we'll be calling soon. Great Christmas memories. Karaoke is the best!